This version of APE was updated with the most recent content, facts, figures, tools, and resources on March 5th, 2013. To see what content has been added since the last update of APE, please visit apethebook.com/updates. This is version 1.2 (Baldacci). With Shawn Welch, a tech wizard, I wrote APE to help people take control of their writing careers. APE's thesis is powerful yet simple: filling the roles of Author, Publisher, and Entrepreneur yields results that rival traditional publishing. We call this "artisanal publishing" - that is, when writers who love their craft control the publishing process and produce high-quality books. APE is 411 minutes of step-by-step, tactical advice and practical inspiration. If you want a hype-filled, get-rich-quick book, you should look elsewhere. On the other hand, if you want a comprehensive and realistic guide to self-publishing, APE is the answer. ©2013 Guy Kawasaki & Shawn Welch (P)2013 Audible, Inc. This is Self-Publishing 101 AND 102 -- a roadmap! 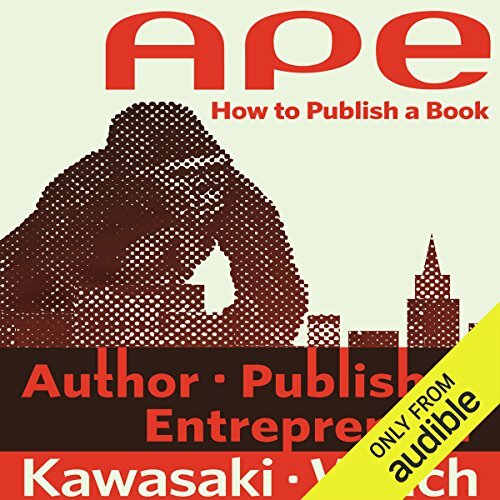 Would you consider the audio edition of APE: Author, Publisher, Entrepreneur - How to Publish a Book to be better than the print version? No, the audiobook cannot -- by the very design of the book -- be better than the print version. I listened while on a 7-hour drive then immediately ordered the print version. APE is one of those books that even Kindle fanatics will want the print version of. The reason: lists, lists, lists...references...contacts...a roadmap for five years of training and work. Smell the book, write in it. bend the pages over. If you have already published an e-book, half the book is old hat but, believe me, you will learn who the big boys are and how to play better than you might have thought you could on your own. We are easily lured into Amazon's publishing wonderland and that may still be an option, but we learn plenty about good options for printing, distribution, marketing, etc. Which character – as performed by Lloyd Sherr – was your favorite? Lloyd Sherr mercifully read at a fast speed so that this data-heavy book stayed interesting. Loved his voice and upbeat tone. What insight do you think you’ll apply from APE: Author, Publisher, Entrepreneur - How to Publish a Book? I am starting the next book with the best outline ever. I am mounting the biggest campaign of my life to engage a large crowd of supporters, influencers, editors, and buyers. The steps outlined in the last 10 chapters provide a roadmap for success. I can feel, taste, and fully imagine what success looks like. What did you love best about APE: Author, Publisher, Entrepreneur - How to Publish a Book? I loved having access to such a wealth of information from a guru on not only self-publishing, but social media and digital marketing. Most of his tips do not cost you anything, and as long as the self publisher is internet savvy, they have full capability of putting these tactics to use. I enjoyed the narrator, he had a strong presence- but after hearing a few of Guy Kawasaki's YouTube clips, I think he could have done a fantastic job. In the book he states that he values time with family and will choose to hire for certain projects, I understand and this was probably his thought process. If your looking to self publish this is the book! If you could sum up APE: Author, Publisher, Entrepreneur - How to Publish a Book in three words, what would they be? Publish your book! This book is the best book on self-publishing that I have read to date! What was one of the most memorable moments of APE: Author, Publisher, Entrepreneur - How to Publish a Book? Great insights on how to publish a book! What about Lloyd Sherr’s performance did you like? I bought the physical copy of the book as well so that I could use as a reference point! On a journey of writing. When the time comes to share my thoughts with the world I have no doubt this information will play a vital role. It is a top notch platinum mentor to guide me to success. Thank you. Great book for any new author!! i thought the book was informative. There is a lot of wxamples which is helps a lot for new authors like myself. I especially like the ending of the book of the process they went to publish their book. Great outline for a beginner. Good narration. Book is well structured. Easy to follow and understand. Regardless of the type of book you may be writing or if you'll self publish or publish traditionally, it's a good reference. I will buy the physical book as well to easily add notes and refer back to advice that was given throughout. Everything you need to know before writing a book and deciding to self publish it. this is a good book for first time publisher. some of it is fluff. however when things get specific then I advise posting attention. Nuts and bolts all here in an eminently readable/listenable guide. More detail than I've seen in any other book, but really well constructed, so you don't get lost/buried.